Brig.-Gen. Lynus Udeagbala has assumed duty as the new Commander of the 1 Brigade, Nigerian Army, Sokoto. This is contained in a statement issued to newsmen in Sokoto on Friday by the Assistant Director, Army Public Relations of the brigade, Major Clement Abiade. Abiade said until his recent appointment, Udeagbala was the Chief of Staff (COS), 82 Division, Nigerian Army. He said that at the handing over ceremony, the immediate past Commander of the Brigade, Brig.-Gen Ginikawa Nwosu, implored the soldiers to accord his successor the support he needed to succeed in his new tour of duty. Highlights of the ceremony were the lowering and hoisting of the Brigade flag to signify the change of command. 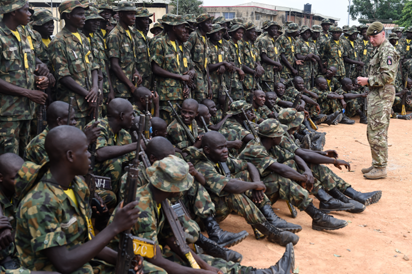 The post 1 Brigade Nigerian Army Sokoto gets new Commander appeared first on Vanguard News.